Welcome! Palco is your one-stop headquarters for brand-new, name-brand CB/HAM/shortwave radios, antennas, scanners, accessories, and other electronics at discount prices. At Palco Electronics... "You Always Get a Whale of a Deal!" A lot of dealers say they give great service... but with us it's not just a slogan! "Amazing, unbelievable, FANTASTIC service from the owner himself. I will be back again and again! An antenna needed by my 68-year-old mom who is driving her RV from Alabama to Alaska was received in only two days rather than two weeks. Thank you for your immense kindness and impeccable business practices." For deep-discount prices and friendly, reliable service, call us at 1-888-282-1313. 1 Deep-discount prices. If you find a lower price, call us! We'll try to meet or beat any legitimate price on (or off) the Web. 3 Reasonable shipping charges. We don't inflate our shipping charges  unlike some other dealers. 4 Buy with confidence. We've been a trusted retail electronics dealer for over TWENTY YEARS and have THOUSANDS of satisfied customers. 5 Large selection of quality products. Most items are in stock and ready to ship. 6 Brand new, factory-fresh merchandise  NEVER seconds, refurbs, returned, or repackaged items. 7 Convenient and secure. Shop on our Website, then use our TOLL-FREE number to order. 8 Prompt shipment of your order. Most orders ship the same or next business day. 9 Our easy-to-navigate website makes it simple to find the items you want. 10 We're not just a Web business  visit our retail store in Southgate, Michigan. Things would have certainly gone very differently for Warner had the Browns taken him we saw what happened to Tim Couch but Warner would have offered a better option than Ty Detmer. It's all hindsight since no one could have predicted a Hall of Fame career back then and Marshall Faulk, Isaac Bruce and Torry Holt weren't coming with him, but this likely was the biggest missed opportunity in the process. Based statistics so far, you would be very impressed with the team. They are averaging a league leading 31.2 points a game and have only permitted 7.2 points a game. They won the 5 games cheap nhl jerseys by 26,27,2, 31 and 33 points for a total of 120 points, the second largest in the men james hardan jersey league. They are second to the St. Louis Rams who have 123 points. The good? Darboh and Chesson were a pair of solid prospects before Harbaugh and his offense arrived at Michigan. And, especially in the case of Chesson, both (almost immediately) blossomed into two of the best pass catching targets in the Big Ten. The athletes who will be replacing them are extremely inexperienced, cheap jerseys but most of them are ahead of where these two were as freshmen and sophomores. On stage at Van Andel Arena, Kid Rock gave the speech early in the show from behind a podium with a seal on it that was reminiscent of the President of the United States Rock also hinted at a run for that office, saying if people are getting riled up by him teasing "Kid Rock for Senate," just wait until they hear "Kid Rock for President." An internship allows you to meet people within the organization and gain industry experience. These provide a behind the scenes look at the NFL through mentoring relationships, networking opportunities and speaker presentations. Many individual teams offer internship positions as well.Work in the IndustryThe Princeton Review reports that GMs are often promoted from head coaching or scouting positions. Watch any NFL game or NBA game and you are likely to see cheerleaders doing dance routines and performing for the crowds to further incite enthusiasm for the home team. Much like the teams on the field or floor, cheerleaders are guided by coaches who are paid to develop and assign routines, schedule practices and hire cheerleaders. Salaries for professional cheerleading coaches can range from minimal salaries to close to six figures. The team had run out of room on the facade cheap nfl jerseys where their first four banners were displayed. So signs were raised. Lights were moved. And the banners recognizing the 2001, cheap china jerseys 2003, 2004 and 2014 titles were shrunk a bit to make room for a fifth that owner Robert Kraft cheap jerseys declared "unequivocally the sweetest.". 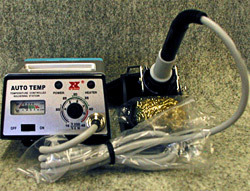 This Auto-Temp soldering station offers the ultimate in controlled temperature hand soldering. Make and receive phone calls through this CB radio with most Bluetooth phones!